Living in eastern Texas comes with many benefits, like a moderate climate and easy access to the Gulf of Mexico. However, this climate is also conducive to a type of bacteria called Gloecapsa Magma. You have likely seen its handiwork here in Tyler, TX. Drive through local area neighborhoods and you'll see many homes that have black streaks or stains running down them. 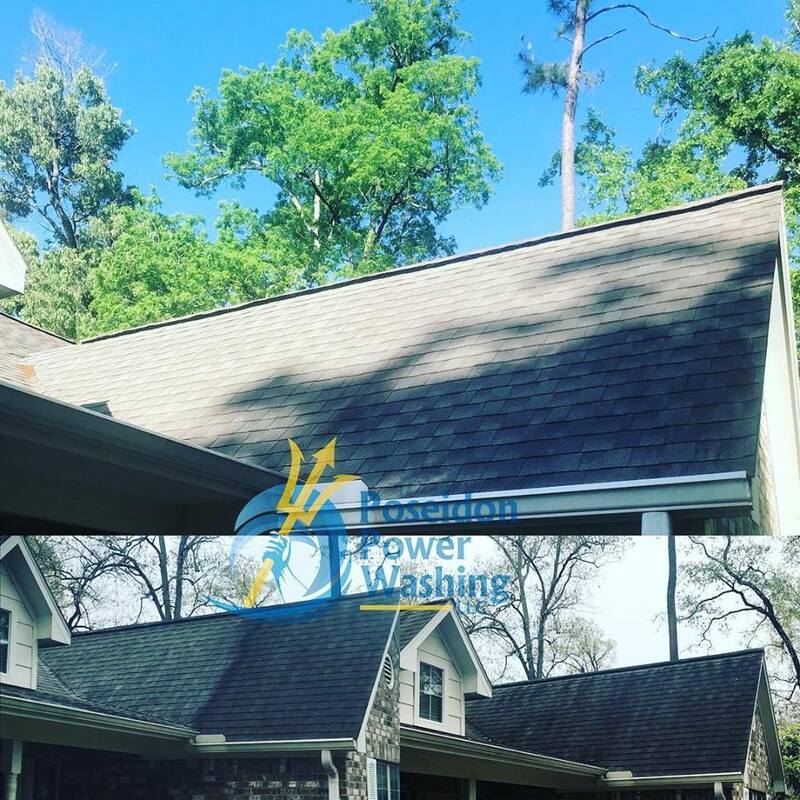 Our soft wash roof cleaning service is 100% effective at removing these stains and preserving the integrity of your roof shingles. Is Something Eating Your Roof? A dirty roof has an overwhelmingly negative effect on your curb appeal. No matter how great the landscaping or how fresh the paint a dirty roof makes your home look dirty! As these black stains spread out and cover more of your roof, the darkened surface absorbs more heat from the sun which makes it harder to cool your home in the summer. The assault from this shingle eating bacteria will dramatically reduce the effectiveness of your shingles and ultimately cause them need replacement much sooner than normal! Say Goodbye To Those Black Roof Stains! 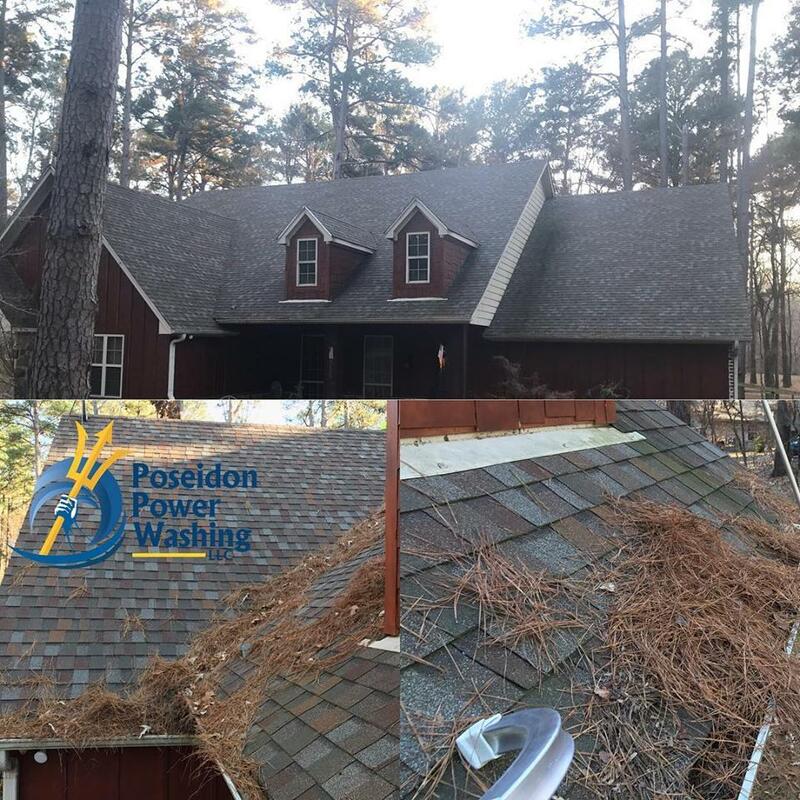 If black streaks have invaded your roof, Poseidon Power Washing can help! 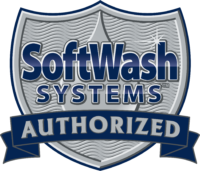 Our soft wash roof cleaning service is just what you need to remove 100% of the bacteria, algae, and other organic stains. Rather than potentially causing serious damage to your shingles with high-pressure cleaning methods, our soft wash roof cleaning uses specially formulated cleansers and a low-pressure rinse to wash your roof. This method is safe for all shingle types and our experience guarantees that your roof will look "like new" for a fraction of the cost of roof replacement. When it comes to your roof, you can't afford to take any chances. Trust in the experience and professionalism that only the roof cleaning experts of Poseidon Power Washing can offer. Our customers rest easy knowing that our soft wash roof cleaning service will never damage their roofs and helps to extend the life of their shingles. By investing in roof cleaning service from Poseidon Power Washing you'll save your homes curb appeal and potentially thousands of dollars in roof repairs, too!